Your home is one of the most important financial investments you’ll ever make, so we suggest a regular home maintenance program will help keep it in top condition. Regular maintenance can also help you identify problems before they become bigger issues and can go a long way in ensuring your home stands up to severe weather events, which happen in parts of Queensland. Prevention is the best cure, and the best way to avoid or reduce issues is by using a licensed building contractor when building or renovating. The Queensland Building and Construction Commission (QBCC) offers some useful resources on home renovation and maintenance. If you're looking for a qualified builder or tradesperson, our Find a Master Builder search will put you in touch with a list of members in your local area who have experience in the particular type of work you require. Asbestos hasn’t been used in construction products since 1989, and has been banned in Australia since 2003, but if you own or are buying a property built before 1990, it’s safe to assume there may be some asbestos present. Products containing asbestos aren’t known to cause harm unless they’re disturbed or damaged in the course of renovations or demolition work. Once disturbed, the fibres become airborne and the risk of a breathing in fibres significantly increases, which can cause lead to illnesses like mesothelioma and lung cancer. Products containing asbestos were used in a variety of locations in residential homes. 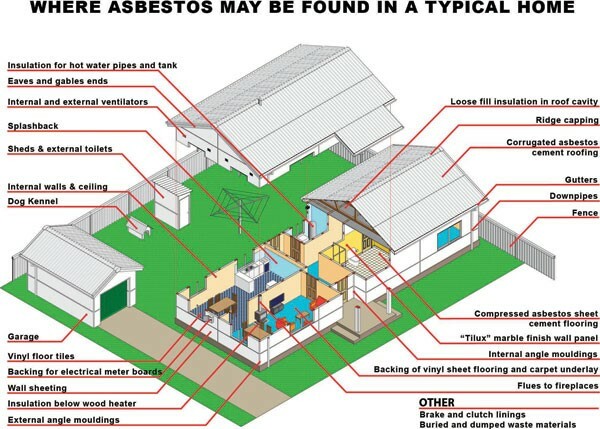 The following diagram demonstrates some possible locations where asbestos may be found in the home. If you plan on undertaking renovations that require removal of asbestos products, we recommend using the services of a licensed asbestos removalist who is trained to remove, transport and dispose of asbestos safely. Read the asbestos information from the QBCC and the Queensland Government. For more information, call the Queensland Government Asbestos Hotline on 13 74 68. The harsh Queensland climate can be unforgiving on decks and balconies, so it's necessary to keep them regularly maintained for safety. Although the vast majority of Queensland’s decks are structurally sound, problems can occur due to a number of reasons – regardless of whether they're made from timber, concrete, metal or another material. If you have concerns about the structural integrity of your deck, a building inspection can be arranged that will assess your deck and provide advice of any issues and/or rectification required. Regularly inspect all components including fixings, nuts, bolts, screws and nails, posts, bracing, bearers and joists, and balustrades anchor points. Regularly inspect and maintain concrete driveways and paths to ensure that serviceability and aesthetics are maintained. Some cracking of concrete may occur due to moisture changes and temperature variations, though this isn't usually a structural issues so no further assessment is required, unless the width of the crack exceeds 1mm. Regularly replenish sealants in high-use areas, such as steep grades and turning circles. Sealants wear quickly in these areas and will often need to be replenished every 12–18 months. Ensure the new sealant is compatible with the original. Home owners are responsible for maintaining the land around your home to ensure it complies with minimum requirements for preserving footing and slab systems. Trees shouldn't be planted within the distance of their mature height from the home – in accordance with the requirements of the relevant site classification. Refer to the CSIRO’s Foundation and Footing Performance: a Home Owners Guide, which can be purchased from Master Builders' eShop. Read the Queensland Building and Construction Commission's (QBCC) information on subsidence for more information. If you notice a problem, contact an appropriately licensed builder immediately. Insulation keeps your home warm in winter and cool in summer to provide year-round comfort, and cuts cooling and heating bills by up to half and reduces greenhouse gas emissions. It also acts to weatherproof or draught-seal houses, eliminate moisture or condensation problems, and sometimes it has soundproofing qualities too. The appropriate degree of insulation depends on climate, building construction type, and whether auxiliary heating and/or cooling is to be used. The most cost-effective time to install insulation is during the construction phase, but it can be retrofitted. The two main types of insulation are bulk and reflective, though sometimes they're combined into a composite material. Bulk insulation relies on pockets of air trapped within its structure to resist the transfer of conducted and convected heat. Examples include glass wool, wool, cellulose fibre, polyester and polystyrene. While reflective insulation resists radiant heat flow due to its high reflectivity and ability to re-radiate heat. Examples include shiny aluminium foil laminated onto paper or plastic available as sheets (sarking), concertina-type batts and multi-cell batts. All insulation materials sold in Australia (even if they're imported) must meet Australian Standard AS/NZS 4859 materials for thermal insulation of buildings, even if they are imported. Leaking roofs are a common complaint from home owners and they're often caused by a lack of regular home maintenance. The Queensland Building and Construction Commission (QBCC) recommends an annual roof clean (before the wet season) to clean out leaves and other debris that can accumulate to block gutters and downpipes. Parts of Queensland frequently experience severe weather events, such as storms and cyclones. Regular home maintenance will help to keep your home and family safe during severe weather events. Most importantly, keep your yard free of potential hazards. If you're in need of repair work following a severe weather event, use our Find a Master Builder search to locate Master Builders members in your area who specialise in the kind of repair work you're after. Termites cause significant damage to homes in Queensland every year. While there is no way to completely prevent termites entering a home or building, termite management systems work to force termites into an exposed location, which allows early detection and eradication. Unless termite management systems are inspected and regularly maintained, the potential for infestation dramatically increases. Incorrectly installed gardens and the storage of materials are two key factors that can obstruct visual zones for inspections and allow the concealed entry of termites. Read the Queensland Building and Construction Commission's (QBCC) information on termite management. If you have a water tank you should carry out regular maintenance to ensure the water in your tank is suitable for use. Use the Find a Master Builder search to locate Master Builders members in your area who specialise in water tank repair and maintenance.